Kantek MS400 Single Level Deluxe Monitor Stand - Up to 60lb Flat Panel Display - Black - Welcome to TABS! 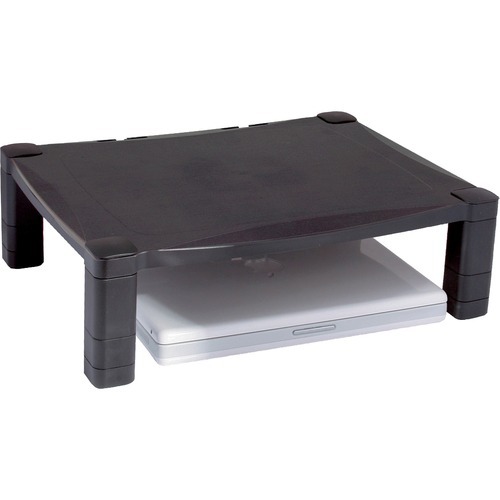 Monitor stand adjusts in height from 3\" to 6-1/2\" in 1-1/4\" increments and offers a 17\" x 13-1/4\" sturdy platform. Wide design is suitable to dock or support today's larger laptop computers. Use stand to maximize your work space while raising your monitor or laptop to a comfortable viewing level. Monitor stand supports up to 60 lb. on the extra large platform and includes cable management. Monitor stand is made of plastic. Monitor stand adjusts in height from 3\" to 6-1/2\" in 1-1/4\" increments and offers a 17\" x 13-1/4\" sturdy platform. Wide design is suitable to dock or support today's larger laptop computers. Use stand to maximize your work space while raising your monitor or laptop to a comfortable viewing level. Monitor stand supports up to 60 lb. on the extra large platform and includes cable management. Monitor stand is made of plastic. Country of Origin: Taiwan Taiwán Depth: 13.3" 13,3"
Material: Plastic Plastico Maximum Adjustable Stand Height: 6.50" 6,50"